Stress is something we all endure. It hovers over us like a specter, stealing joy and making us worthless. But where does it come from? Why does it ebb and flow? 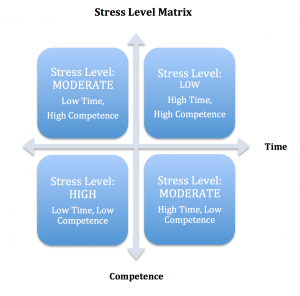 In working with clients – both students and adults alike – I’ve identified two major factors which influence our stress level. Competence we feel in performing a task. Let’s consider four possible combinations of these two elements, beginning with the least stressful and moving to the most. A “suggested action” for minimizing stress is provided for each scenario. This is the most relaxed of all situations, when we have plenty of time to accomplish a task which we know exactly how to do. Examples might include simple homework not due for a week, routine errands for items which aren’t desperately needed, or reading through trade publications. These are tasks that we know we can easily accomplish and feel no real pressure to tackle. The risk in this scenario is procrastination, as we often delay working on items for which there is no pressing deadline or accountability. Suggested action: Implement a deadline so you can complete this task with ease. Stress for this scenario is moderate. Jobs that fit here include anything which must be completed by a pending deadline, but which we have a high comfort level accomplishing- tasks we have tackled many times before and know exactly how to do. Examples may be completing routine forms, picking up children from school, or homework for a class we do well in. There may be little time, but if we just get “in the zone,” we know we can knock it out. Suggested action: “Just do it!” Grab your favorite beverage or put on your favorite music and set your mind on bringing your “A” game until you are finished. This is another moderately stressful scenario. In this case, we have plenty of time, but we aren’t sure how to proceed. Classic examples here would be long term projects in school, new assignments at work, or new parenting challenges. Again, this is a situation at high risk for procrastination, as we tend to put off tasks that are uncomfortable. Suggested action – Ask for help! Whenever we aren’t sure how to proceed, it is smart to ask around… a teacher, a parent, a colleague or a friend can often give us ideas on how to take a first step. Taking even one small step forward will often lead us to a logical next step, and eventually to completion. Furthermore, moving forward – even if it seems ever so slightly – is a huge stress reliever. This scenario is stress central. The clock is ticking, something is due (or past due), and we have no idea how to get it done. Frequently, we end up here because we have procrastinated (“I have plenty of time…”) and now we are under the gun. Or perhaps we were dealt an unexpected life situation (illness, death, accident) which stole time out of our schedule. And of course, there is the common assignment given on Friday, due on Monday morning. Suggested action – Get help and get going. If you are hopelessly under water, you may need to seek an extension or reschedule. Perhaps you need to hire help, or swap a favor with someone who has the expertise you need. Avoid making excuses as they are not typically well received. Instead, be realistic, be humble, and make a schedule for getting it done (hour by hour, if necessary.) Unfortunately, the results of this situation may not be ideal. Rather than berate yourself, take concrete steps to minimize your chances of ending up here again. Identifying the sources of stress in your life – especially those that repeatedly appear – can set you on a course for a more peaceful future. Submitted by Seana Turner, founder & President of The Seana Method.